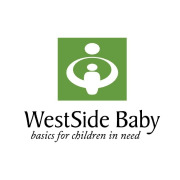 WestSide Baby is the only social service agency in the West King County area that collects, inspects and distributes free diapers, clothing, cribs and safety gear for babies and children. We keep children safe, warm, and dry. Our Beginnings Donna Pierce started WestSide Baby in 2001 because, she says, "I was one stressed-out, freaked-out new mom, even though I didn’t have to worry about having enough money to feed, clothe, and diaper my babies. I couldn’t stand imagining the level of stress felt by new moms with low incomes, no incomes, no healthcare, no home. WestSide Baby had to be born." Our Mission WestSide Baby, in partnership with our community, provides essential items to local children in need by collecting and distributing diapers, clothing, and equipment. We work toward a day when all babies and young children in our community have their basic physical needs met. We work with local social service agencies already assisting low-income families. Agencies order items from us and deliver them to families who are homeless, living in transitional housing, or simply in need of a little help during a difficult time. WestSide Baby accepts donations. Donate Now. Would you recommend WestSide Baby?